It’s March, which can only mean one thing: Parking Madness time. Last year we asked our readers to help us crown the worst parking crater in an American city, and in that inaugural 16-entry bracket, Tulsa blew away the competition. But we know there are still plenty of other parking lots out there that make downtown look like a lunar landscape, so here comes the sequel. A couple of things are different this time around: We’re accepting submissions from anywhere, not just the United States, though we won’t consider the 16 entries from last year’s tournament. In some cases, like Tulsa, this will probably rule out the entire city, but other places have more than one god-awful parking crater in town. Before you submit a parking crater, please review last year’s field so you can avoid sending an ineligible entry. So show us the worst parking scars marring your city. Send your parking crater photos and a brief explanation about why it’s the worst to angie [at] streetsblog [dot] org by Friday, March 14. I would like to nominate Portland’s own little area of parking in the downtown. Almost 4 blocks of parking. Part of the problem is that for many owners it is cheaper to tear down the building and have parking than to pay taxes and they are waiting for the economy to improve before selling. A couple ridiculous parking craters in Downtown Miami. Million dollar parking views, overlooking the Miami River and Biscayne Bay. Downtown Newark, NJ surrounding Newark Penn Station -Where Amtrak, Commuter Rail, Heavy Rail, Light Rail, Private Local and Regional Bus Carriers, BRT, Express Buses and Local buses are all contained in one facility. This is in the suburbs of Baltimore, but it merits consideration because of all these factors. Owings Mills Metro Station, a 27-year old rail station across from a mall with approximately a 25% occupancy rate with office buildings to the west with their own parking, a parking lot to the north side of the expressway, and office parks to the North and South. All around a heavy rail metro train line that sits in the median of the expressway. The movie theater in between the mall and the station has its own parking lot. Not a completely updated photo as a 2,000-plus parking garage built next to the station is not in it with a 2nd equally-sized garage currently under construction. Fill in all of the extra parking with residential, office, retail, cultural spaces, parks, and a shrunken interchange, and it would be its own city. The real kicker of that part of Newark is that the funnel shaped lot to the left is the former yard of the CNJ’s Newark division. You can follow the former right-of-way from that unused bridge at the center to Jersey City. You can still see the Station building on Broad Street, near the intersection of Market. Perhaps one day the two light rail systems (NLR &HBLR) can be connected using the ROW. I’d like to know how Indianapolis wasnt nominated last year, looking at that place in Google Maps I think it could have gone all the way. Proximity to the freeway is what’s hurting the Grand Rapids location. Scout around Grand Rapids a little, and you’ll find more massive parking craters west of the freeway west of the river. Proximity to the freeway is what’s hurting the Grand Rapids location. craters west of the freeway west of the river. I particularly “like” the four blocks between Mt. Vernon Ave and Seward Ave, north of Lake Michigan Drive. Oh, come on! We don’t have any nominations comparable to Bell St. Metrorail Station in Houston, Texas yet. Can’t people find some worse parking? Columbus Community College appears to be primarily an institution of parking. In addition to the large parking garage, most of its land area consists of surface parking lots. I’m not sure where they find room to teach. There is a LOT more surface parking in downtown Columbus, although it is interrupted by the occasional building. Interestingly, the epidemic of parking is largely confined to the area strangled by the expressway “belt”. Get out from the strangling expressway and the parking epidemic receds. Rockville MD is shaping up to be a pretty nice town center, but it’s still suffering from this horrible crater. To be fair, half of it is being built on already. This shopping centre is so bad it was even named after a car. Every big building in the surrounds is a parking crater. It’s more like a crater super cluster. 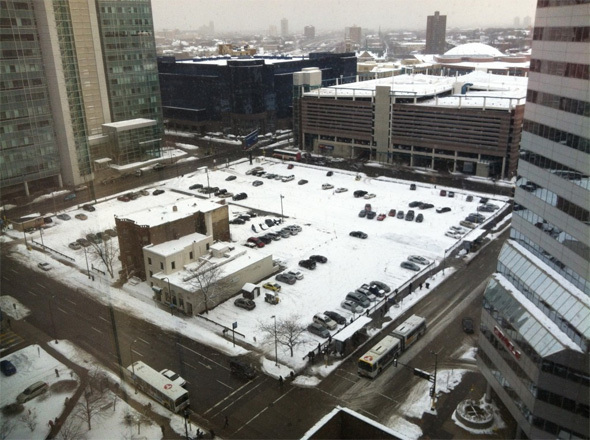 Downtown Detroit may be the parking crater capital of the U.S. There are so many lots that you’re not sure if parking is allowed. No one is around to take your money or give you a ticket. It’s March: Send Us Your Parking Craters! Send us your nominations for the worst parking crater in an American city by March 15 to enter this year's tournament. It’s Tulsa vs. Milwaukee in the Parking Madness Championship!